, BOADICEA THE VICTORIOUS, BYREDO, Carner, CARTHUSIA, CLEAN RESERVE, CIRO, CREED, CULTI, CZECH & SPEAK, COLLECTION CROISIERE, DIPTYQUE, D.S&Durga, D.R. HARRIS, Eight&Bob, ESCENTRIC MOLECULES, ESTEBAN, ETRO, Fornasetti, FRAPIN, FREDERIC MALLE, Friedemodin*, GOCCE DI BYRON, HEELEY, HISTOIRES DE PARFUMS, HOUBIGANT**, Huitieme Art* (Collection Noire), HUMIECKI & GRAEF, Isabey, J.F. Schwarzlose, KEIKO MECHERI, KNIZE, Kinski, Laurent Mazzone (LM Parfums), LINARI, Laboratorio Olfattivo, LIQUIDES IMAGINAIRES, LORENZO VILLORESI, Mark Buxton, MILLER ET BERTAUX, MONTALE, MARC-ANTOINE BARROIS, NASOMATTO, NASENGOLD, NOBILE 1942, NAOMI GOODSIR, NOTE DI PROFUMUM, Olibere Parfums*, Ormonde Jayne, Olfactive Studio, ORTO PARISI, OLIVER & CO. PERFUMES, PANPURI, Pierre Guillaume PARFUMERIE GENERALE, PMP – PERFUMES MAYR PLETTENBERG, PROFUMI DEL FORTE, PROFUMUM ROMA, PHILLY & PHILL, ROBERT PIGUET, SANTA MARIA NOVELLA, SENTIFIQUE*, TERESA HELBIG, THE BEAUTIFUL MIND, THE DIFFERENT COMPANY, THE LAUNDRESS, TIZIANA TERENZI, Yosh*, Xerjoff. Brands: at least 2787 Perfumes BARCELONA*, Aether*, Acqua di Parma, Amouage, Annick Goutal, Atelier Cologne, Atkinsons, Bill Blass, Bois 1920, Bond No 9, Carner*, Caron, Carthusia*, Clive Christian, Clean, Cire Trudon*, COMME DES GARCONS, Creed, Etro, Floris, Frapin*, Guerlain (incl. golden Guerlains), Houbigant, Histoires de Parfums*, Jo Malone, Jul et Mad*, Juliette has a Gun, Keiko Mecheri, Kinski, Korres, Le Galion*, Ligne St Barth, Lorenzo Villoresi, Lubin*, Morph*, Mark Buxton*, Moresque*, Molton Brown, Miller Harris, Mark Birley, Maison Martin Margiela, Parfums Berdoues, Philly & Phill*, Penhaligon's, Pozzo di Borgo, Room 1015, Roos&Roos (Dear Rose), Rosebud, STARCK PARIS, Six Scents*, Sous le Manteau, Tiziana Terenzi*, The House of Oud*, Urban Scents, Van Cleef & Arpels Collection Extraordinaire, Vilhelm Parfumerie, Verduu*, Zeromolecole. Once there also used to be 10 Corso Como, Armani Prive*, Acca Kappa, A Lab On Fire, Acqua di Biella, Aqaba, Atelier Flou, Alvarez Gomez, Acqua di Genova, Acqua di Portofino, Aedes, Baruti**, Boellis 1924, biehl.parfumkunstwerke, Borsari 1870, By Kilian, Czech&Speak, d'Orsay*, Divine, Etat Libre d'Orange, E.Coudray*, EGOFACTO*, Escentric Molecules, Goti, Helmut Lang, Hugh Parsons, Hayari Paris, Hierbas de Ibiza, Join the Club, Jacques Fath, Le Cercle des Parfumeurs Createurs, Lena Hoschek, Liaison de Parfum, Maitre Parfumeur et Gantier, MariaLux, Mazzolari, Nasengold, Nejma, Nobile 1942, nu_be, Peccato Originale, Paper Passion, PARFUMS QUARTANA, Percy & Reed, Perris Monte Carlo*, ROADS, Robert Piguet, Stephane Humbert Lucas, Santa Eulalia, Saskia Diez, Terry de Gunzburg, The Beautiful Mind, Tom Daxon, The House of Oud, Tom Ford Private Blend, Teresa Helbig, Unum, Undergreen, Washington Tremlett, Xerjoff, ZARKOPERFUME. Brands: 2787 Perfumes BARCELONA, Annick Goutal*, Atelier PMP, Atelier Cologne, Atkinsons*, Amouroud, Acqua di Parma, By Kilian, Byredo, BLOOD Concept*, Carthusia, Chabaud, Clean Reserve, Clive Christian**, Comme des Garcons, Carner, Creed, Collection Croisiere*, Diptyque, Eight&Bob, Egofacto*, Eutopie*, E. Coudray***, Edward Bess, Escentric Molecules, Gritti Venezia, GOSHA RUBCHINSKIY, Geoffrey Beene, Geza Schön, Houbigant, Initio Parfums Privés, J.F. Schwarzlose, Jacques Zolty, Jean Patou, Juliette Has a Gun*, KINSKI, Laboratorio Olfactivo, Laboratory Perfumes, Lubin, Mark Buxton, Molton Brown, MiN New York, Miya Shinma*, Maison Martin Margiela, Miller & Bertaux, Naomi Goodsir*, Nasomatto, Nasengold, Nomenclature, Noble Isle*, Odin*, Olfactive Studio, Parfums de Marly, Parle Moi de Parfum, Project Renegades Bertrand Duchaufour, Perris Monte Carlo*, Ramon Monegal, Shanghai Tang***, Saskia Diez, Scent Bar, Serge Lutens, Taylor of Old Bond Str, Teresa Helbig, The Beautiful Mind Series, UERMI, Welton London, Zarkoperfume. There also used to be Azagury, Bella Freud, Roads. Brands: Armani Prive, Acqua di Parma, AESOP, AETHER**, Amouage**, Annick Goutal, ATELIER COLOGNE, ATELIER PMP, Atkinsons, BYREDO, Bond No 9, By KILIAN, CARNER BARCELONA**, CASAMORATI DAL 1888, Comme des Garcons, Clive Christian, Creed, Clean Reserve, Diptyque, Dior Privee, Diana VREELAND, Evody*, Etro***, EMESHEL, Eutopie*, EIGHT & BOB, ESCENTRIC MOLECULES, FLORIS**, FRÉDÉRIC MALLE, Frapin*, GALLIVANT**, GRITTI, Guerlain Exclusives, Helmut Lang***, HERVE GAMBS, Histoires de Parfums*, INITIO, J. F. Schwarzlose, JO MALONE, Juliette Has a Gun**, JUSBOX, Kiehl's, LABORATORIO OLFATTIVO, Ligne St Barth, LENGLING, LIQUIDES IMAGINAIRES**, MOLINARD, Maison Francis Kurkdjian, Molton Brown, Maison Martin Margiela, NASENGOLD, NOBILE 1942, Odin, Parfums Micallef, Parfums de Marly, Penhaligon's, Premiere Note*, PHILLY & PHILL, PHUONG DANG, Ramon MONEGAL**, Roja Dove, Shanghai Tang***, Simone Andreoli*, Serge Lutens, SHAY & BLUE, Taylor of Old Bond Street, Tom Ford Private Blend, The Merchant of Venice, THAMEEN, The Different Company*, Ulrich Lang***, UNUM, V CANTO, VILHELM PARFUMERIE**, VERDUU, ZARKOPEFUME. There also used to be Comptoir Sud Pacifique, Geoffrey Beene, Hugh Parsons, Isabey, Jean Patou, Knize, L'Artisan, Laura Mercier, Miller Harris, Poiray, Profumi di Pantelleria, Ranja J. Brands: Acqua di Genova, ACQUA de PORTOFINO, BOIS 1920, Boellis, CARON, CAMPOS DE IBIZA, Florascent, Frapin, HUGH PARSONS, Houbigant, Ineke, ISABEY, Jean Charles Brosseau, Knize, Les Parfums de Rosine, LINARI, Maison Francis Kurkdjian, Montale, MEMO, PARFUMS DELRAE, PUREDISTANCE, Paolo Gigli, Poiray, Panama 1924, VON SIERSTORPFF. Brands: Acqua di Parma, Amouage, Annick Goutal, Atkinsons, Björk & Berries, Bond No. 9, By Kilian, CARON Paris, Clive Christian, Comme des Garçons, Creed, Etro, Gallivant, Geoffrey Beene, Jacques Zolty, Jean Patou, Jo Malone London, Juliette Has a Gun, Kiehl’s, Laura Mercier, Lengling, Lubin*(@Heegbarg), Maison Francis Kurkdjian Paris, Maison Maison Margiela, Malin+Goetz, Molton Brown, Maison Lancome exclusives, Penhaligon's London, Rance, Robert Piguet, Serge Lutens, This Works, Tom Ford Private Blend, Terry de Gunzburg, Van Cleef & Arpels Collection Extraordinaire, Zarkoperfume. Brands: Comme des Garcons, Geodesis, Henrik Vibskov, Heeley**, John Derian, Meo Fusciuni. Brands: Arty Fragrance, Cire Trudon, DL & Co, Jardins d'Ecrivains, Quintessence, RPL Parfums. Brands: at least Amouage (at least @Hanseviertel), Annick Goutal, Comptoir Sud Pacifique, Hugh Parsons, Juliette has a Gun, Maison Francis Kurkdjian, Penhaligon's, The Different Company*, Widian (at least @Hanseviertel). Brands: at least carthu tizia lore Baobab Collection, Carthusia, Culti, Casamorati, Cire Trudon**, Diana Vreeland, Diptyque**, Escentric Molecules***, Fornasetti, Helmut Lang Parfums, Histoires de Parfums, Humiecki & Graef, Lorenzo Villoresi*, Linari, Ligne St. Barth, Memo***, Molton Brown**, Montale, Sospiro, Tiziana Terenzi*, The Beautiful Mind***, Zarkoperfume, Xerjoff*. Brands: Ciatu the Soul of Sicily, Etat Libre d'Orange, Tom Daxon, Une Nuit a Bali. There also used to be Etat Libre d'Orange, Terry de Gunzburg, Tom Daxon. Brands: Acca Kappa, Bronnley, Culti, Caswell Massey, Czech&Speak, D.R.Harris, Durance, La Compagnie de Provence, Millefiori, Ortigia, Penhaligon's, Truefitt&Hill. Brands: E.Coudray, Huitieme Art (Collection Noire), Humiecki&Graef, Jovoy, Uermi. Brands: Abel, Florascent, Farfalla, Zarko Perfume. Brands: at least Lengling, Lubin. Brands: Comme des Garcons (incl- some CdG' series), Gosha Rubchinskiy, MALIN+GOETZ. 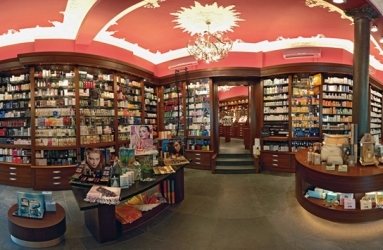 Brands: Acca Kappa, Arty Fragrances, Laboratorio Olfattivo.